My previous blog discussed the startling idea that war, despite all the blood, death, and suffering it has inflicted on countless humans over the ages, is actually good for something. 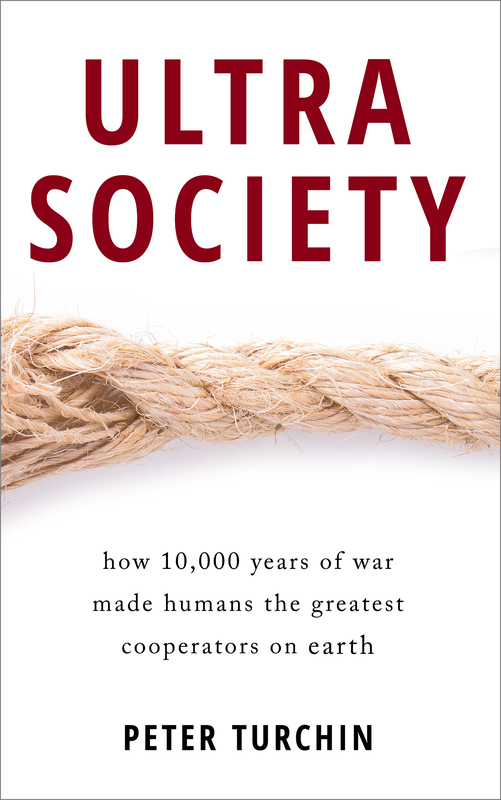 As the historian and archaeologist Ian Morris argues, war “drove the creation of increasingly effective governments, which pushed down rates of violent death,” ultimately resulting in more peaceful and, with time, more prosperous societies. In many ways this is an uncomfortable conclusion. But nobody proposes that we administer a ‘healthy dose’ of “blood and iron” (to use the immortal phrase of the Prussian Chancellor Otto von Bismarck) to encourage state building in such places as equatorial Africa. In fact, many African countries are already mired in an endless cycle of war. Not only such violence causes a huge amount of human misery, it has done nothing for bringing about more effective governance. On the contrary, in a number of places warfare destroyed the last vestiges of state-level organization. It is clear that war is not always and everywhere ‘productive,’ that is, driving the evolution toward bigger, safer, richer societies. Under many circumstances it is highly unproductive, or even ‘counterproductive,’ a point that Ian Morris readily acknowledges. So what are the circumstances that make war productive, or unproductive? 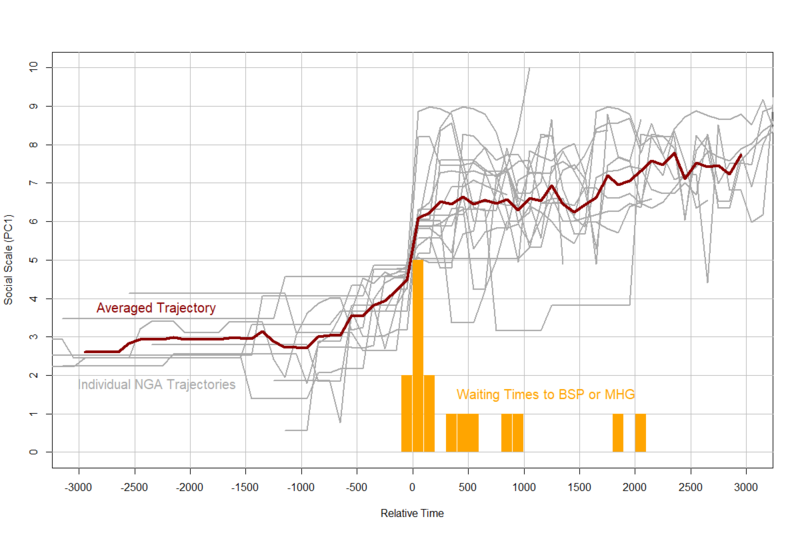 In his Cliodynamics article and the forthcoming book, Ian proposes that there are a geographic dimension and a time dimension in explaining the shifting roles of war in social evolution. Drawing on the ideas of Jared Diamond (Guns, Germs, and Steel) Morris notes that these were the areas with densest concentrations of potentially domesticable plants and animals. Those were the regions where agriculture was invented and then spread to the rest of the world. But because similar soils and climate conditions tend to be arranged in bands stretching East-West, agriculture spread first in such ‘latitudinal’ directions. Spread in the northern and southern directions required adaptation to different climates, and thus was much slower. So far so good, although there are problems with this story (which is a topic for a different blog). 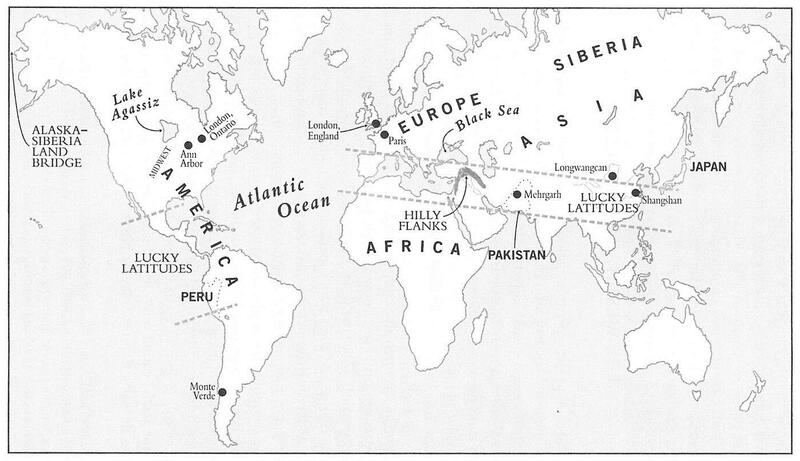 Just note that the lucky latitudes are quite different in the New and the Old Worlds (they barely overlap). So more is going on than just latitude. But there is no question that agriculture in these parts of the world increased the potential population densities by an order of magnitude. 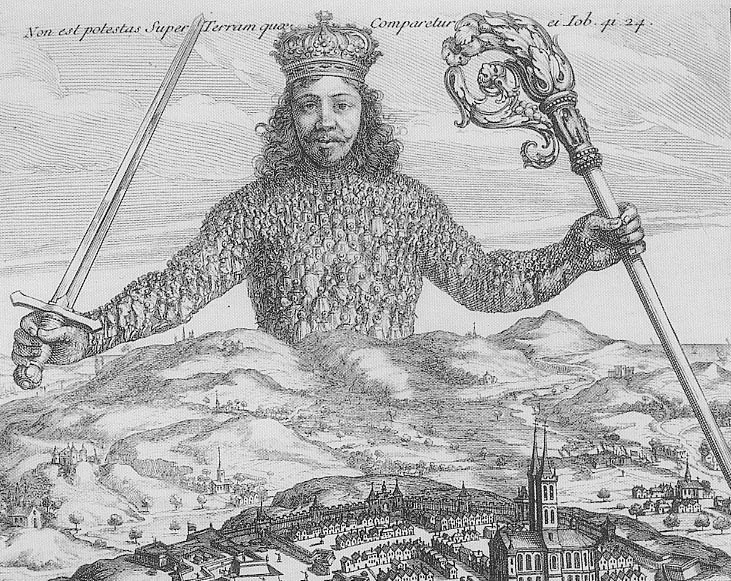 The landscape filled with human populations, and when one group was defeated by another, it had no place to go – it could submit and be added to the growing Leviathan, or die. Most submitted. The anthropologist Robert Carneiro, author of the one of the most influential warfare theories of the state, calls this the circumscription effect. 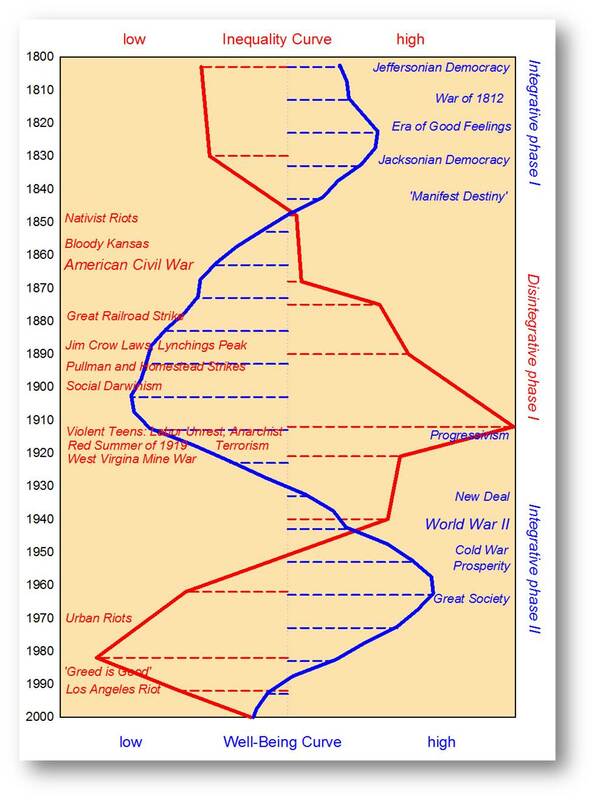 In the Lucky Latitudes, thus, the alternation of productive versus unproductive wars, leading to the cycle of the rise and collapse of empires, on balance favored the productive war. The size of empires increased during the Bronze and Iron Ages (roughly, the second and first milennia BC). It increased especially rapidly during the centuries between 800 and 200 BC. Then it stopped increasing. Ian actually suggests that the size of empires decreased between 1 AD and 1415 AD. It doesn’t look that way to me, but it is undeniable that the size of largest empires stopped increasing – empires rose and collapsed but the areas they controlled at the peak oscillated around 3 million square kilometers – the size of modern India or Argentina. The two peaks you see in the eighth and thirteenth centuries are the Islamic Caliphate and the Mongolian Empire of Chinggis Khan and his successors. Neither was sustained for very long. I see the social evolutionary dynamics between 1 and 1415 AD (or, between 200 BC and 1500 AD in my preferred terms) differently. And my disagreement with Ian is based on both empirical and theoretical grounds. Empirically, I agree that if we measure social scale by territory that empires manage to control at the peak, then there indeed was stagnation between 200 BC and 1500 AD. That’s an empirical fact. 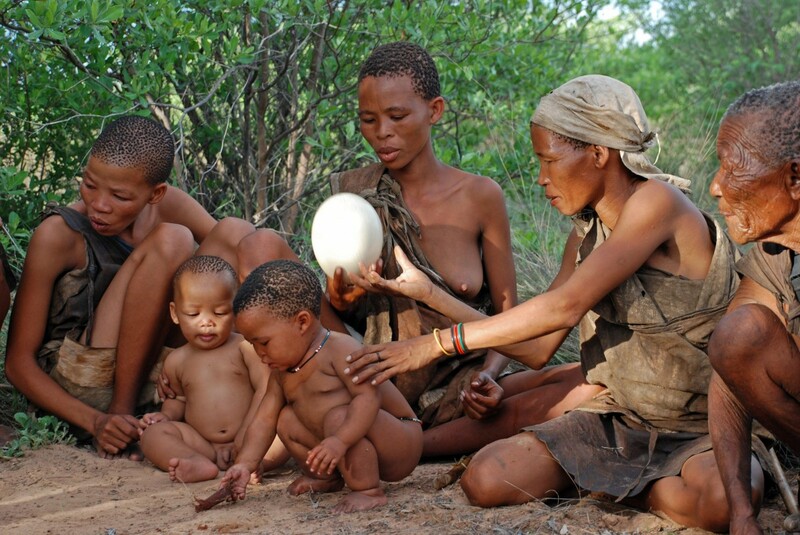 But the social evolution did not stop during this era. Other dimensions of social complexity evolved. For example, the Chinese historian Victoria Tin-bor Hui (War and State Formation in Ancient China and Early Modern Europe) observed that during the Chinese Imperial period (roughly, 200 BC – 1900 AD), the interregnum periods of political fragmentation, which followed collapses of the great Chinese dynasties, became progressively shorter. Something was accumulating that increased the ability of the Chinese state to reconstitute itself after collapse. Why did size of empires decrease between -1100 and -750, and why did we not get a similar drawback after the rise following mounted warfare? 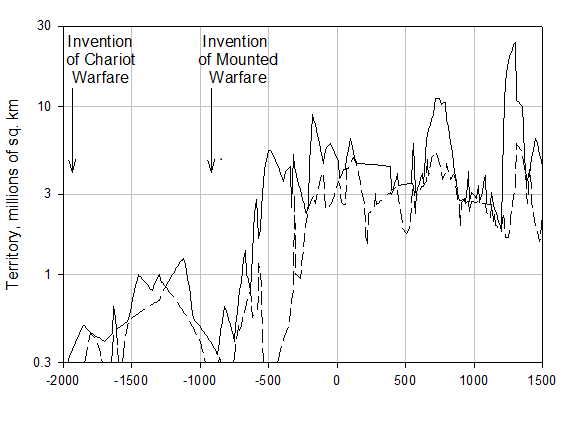 Why was the effect of the invention of chariot warfare not sustained? The first up-sweep affected mainly just one region, the Near East, so when empires there collapsed during the Crisis of the Bronze Age, we see the decline. Empires rise and fall all the time, but after the up-sweep of the Axial Age, there were multiple regions with mega-empires and they did not collapse synchronously. So there was always at least one that was at ~3 million sq. km. Note, however, that there were still periodic declines, if not as dramatic as the one around 1000 BCE because there was some degree of synchronicity in Afroeurasia. I don’t claim the case proven by any means, only that the evidence is non-trivial. That’s right, societies compete not only by getting better at fighting. In fact, the fighting ability is less important than organizational and productive capabilities. “after the up-sweep of the Axial Age, there were multiple regions with mega-empires and they did not collapse synchronously. So there was always at least one that was at ~3 million sq. 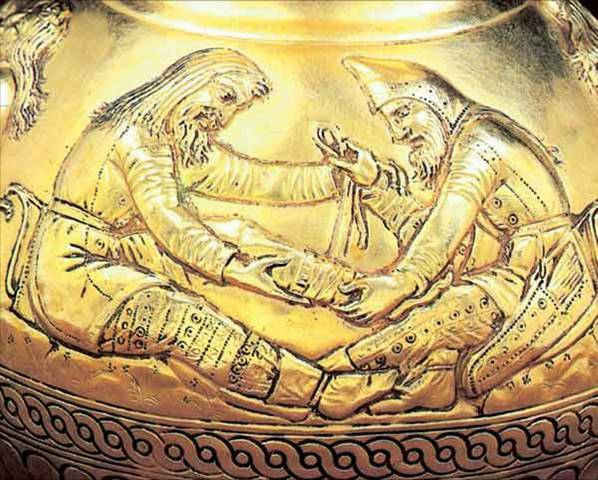 km.” I think they became joined together and fed off each other, creating the same ‘system’ as before – which was confined to the near east – with the same fundamental processes at work only this time operating at a higher scale.